I love this rug I decorated in that 60s modern look and this rug was just what I was looking for. Shipping was very fast. The colors are really nice more beige than white. 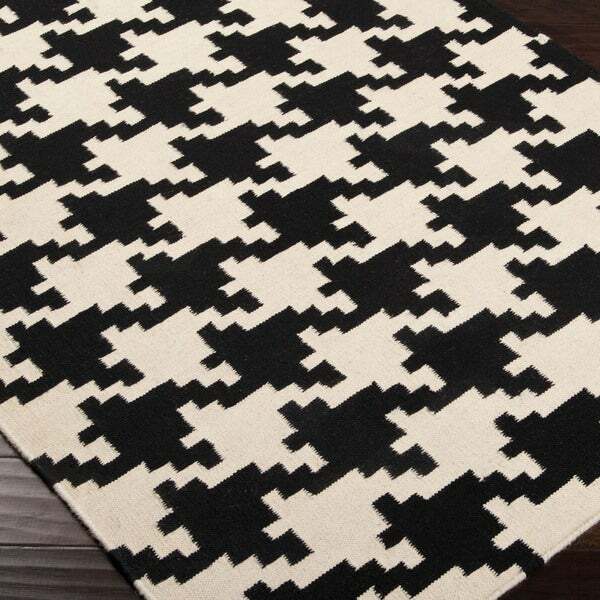 Add bold style to your decor with this houndstooth patterned rug. Hand-woven with wool, this flatweave reversible designed rug enriches any room. I love this houndstooth rug! The black and white color fits perfectly with my kitchen decor. The size and thickness is great. The quality of the rug is nice. I wanted a gray houndstooth rug and after reading the reviews on the gray being blue, I took a chance and decided to order the taupe color. It turned out to be gray just as I hoped. It will look nice in my new kitchen. This is a nice flat wool rug. It is just as pictured, a nice touch but not "too much." I love the rug, the only complaint I have is that it’s off white and black. I was looking for black and white. For the price, I will keep it and use it. This rug was labeled as charcoal grey but ended up being a bluish grey. "Is the taupe rug and the charcoal rug accented with white? Also I'm confused about which is the gray and which is the taupe"
This rug matches the decor in my kitchen. I love th houndstooth pattern! It also recieved good reviews.